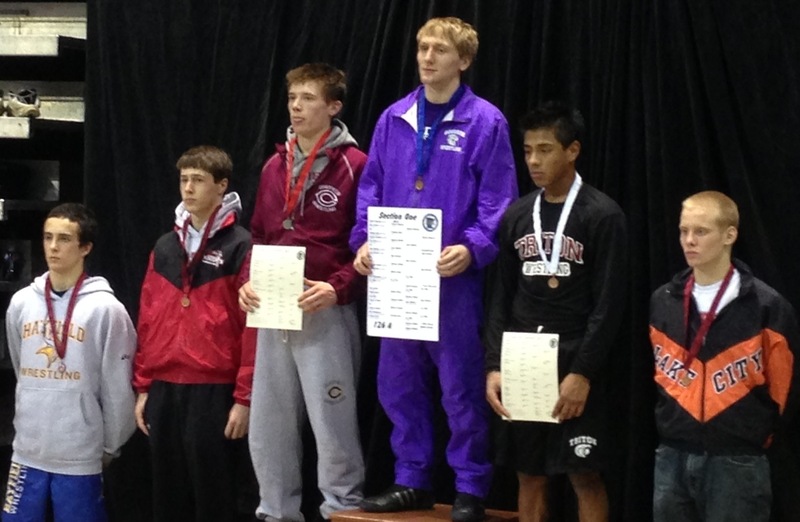 The Goodhue Wrestling Team completed the 2013 Section Individual Tournament with a strong finish. In the third place round, both Matthew Lexvold and Bailee O’Reilly ended the season in 3rd Place, and both got revenge on opponents from the regular season. Matthew overcame a 4-2 loss to Keach of D-E to pin him in under a minute. Bailee reversed a 6-5 loss to Olson of W-K, defeating him 8-3. 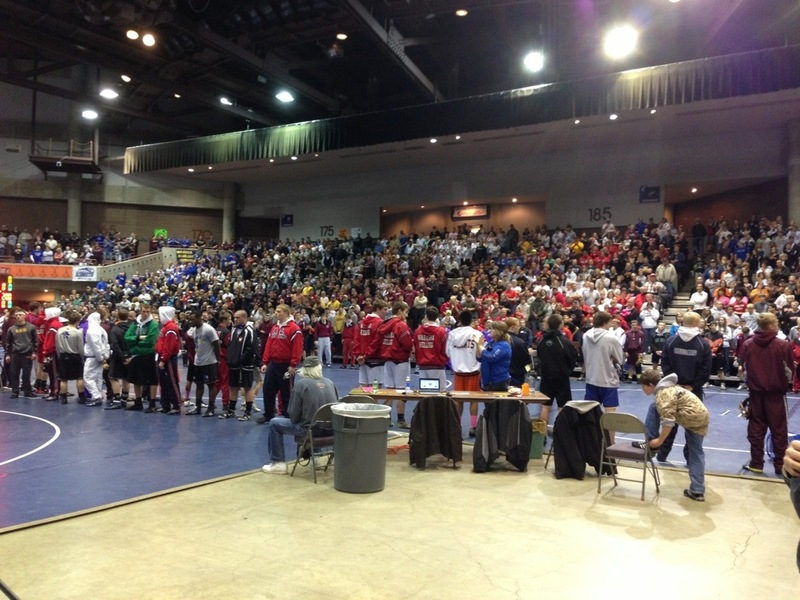 Parade of Champions and Awards preceded the 3rd and Championship Matches. Four Wrestlers made it through the semi-finals to wrestle in their weight bracket final. First up… The #6 seed, freshman Joel Gadient had an outstanding tournament. In his quarterfinal, he downed a senior and #3 seed by running up the score and then getting the pin. Joel used the same formula in his semi-final to move past the #2 seed. In the finals, a #1 seed and 2x State Place-Winner was too much for Joel. 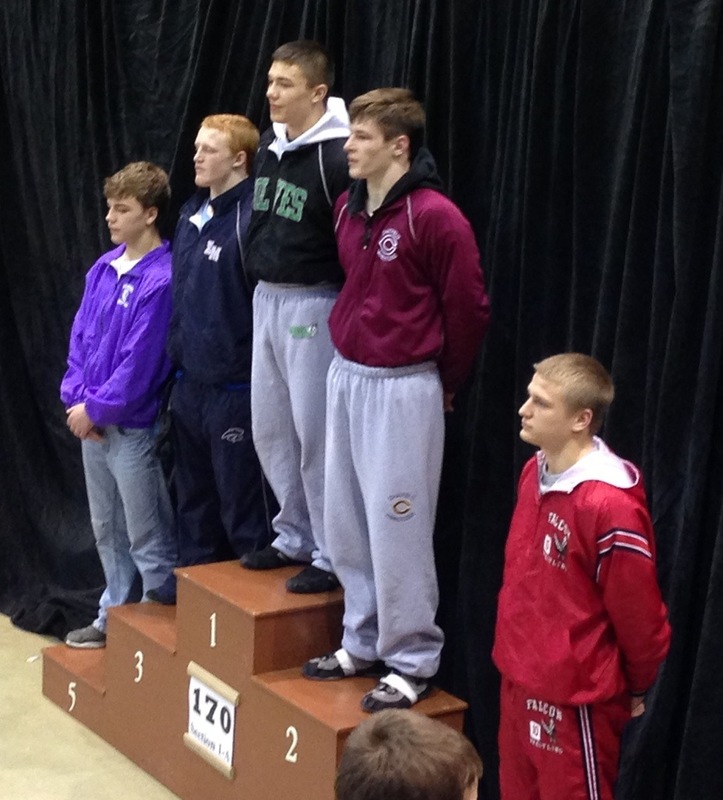 But with no true second, Joel earned his first trip to the State Tournament at 113 pounds. Two weights later, Kyle Drehmel was on a mission, entering the tournament as a #3 seed. Earlier in his semi-final he exonerated two of his earlier record blemishes. One of those losses was just one week earlier, losing in OT. This time, again in overtime, Kyle got the takedown to defeat #2 seed and #4 state ranked AJ Riley of Chatfield to get in the finals. Having suffered a regular season 3-0 loss to #1 seed and #3 state ranked Ramirez of Triton in January, Kyle dominated in his first Section Championship match, winning 5-3. After back-to-back years of heartbreaking losses in the semi-finals in tough tough brackets, in his last season Kyle put together a perfect Section Tournament. At 160 pounds, Jacob Blattner entered as the #3 seed. In the semis, he squared off against the #2 seed, who he had lost to 5-0 earlier in the year. But Jacob wasn’t about to let that be the story line this time. Down 2-1 in the closing seconds, Jacob defended a leg ride and flipped his hips at the last second to earn reversal points and take the match 3-2. He would lose 9-3 in the finals to Jackson of KW, but with no true second, the senior had become the third Goodhue wrestler to punch his ticket to the Xcel Energy Center the next weekend. Ryan Tipcke thought three was too few, so he decided to make it an even four state entrants as well as tie up the Section Runner-up/Section Champion balance so all the section placings would be even. Ryan, the #2 seed, defeated #3 seed and returning state entrant by pin, then downed the #1 seed by a score of 6-2. Congratulations to the team and individuals for putting together two great weeks of wrestling for Goodhue! 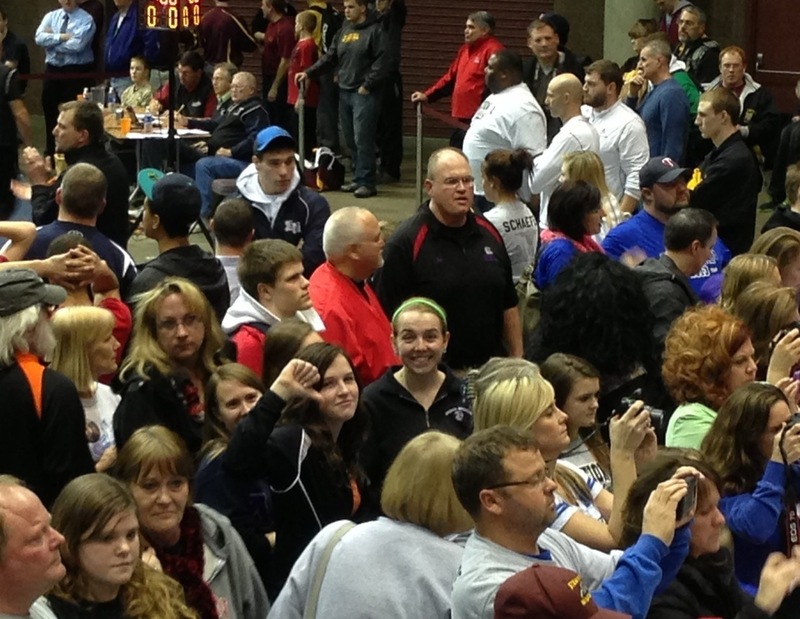 Can you find the statisticians waiting to take podium pictures?